How can I use the CTMH Artfully Sent Cartridge to make the car card if I have the Cricut Explore? When I got my Explore I donated my other machine to a school. I don’t find the Artfully Sent Cartridge on the Cricut Design Space All other CTMH cartridges are there on Design Space but this isn’t. Why is that please? So far I’ve not been able to use this latest Cricut/CTMH cartridge at all. Your cartridge should be working with your Explore® machine. We haven’t experienced that dilemma with ours, so perhaps a phone call to the manufacturer, Provo Craft, will help. You can contact them at 1-877-727-4288 to ask questions about your machine. Hope that helps! Simona, If you click the insert images and then select “cartridges”, over in the search box, type in: CTMH Artfully Sent, your cartridge will come up. I know the other cartridges like Art Philosophy will come up in the “A”s by just typing in Art Philosophy, but with Artfully Sent, you have to add the CTMH first. I would like to know too as the Icon Car cannot be ‘ungrouped’ to get the different pieces for different colored paper….for instance to get the wheels in black you’d have to cut the whole car out in black and then cut out the wheels separately wasting the rest of the black car….and then so forth for the other colored pieces of the car. Please someone advise how this was done in Design Space. THis is such a cute card! It is really hard to come up with ideas for father’s day cards. how did you get the car layers so perfect? I don’t see how to get the different layers. Cathy, I used a 1.25″ circle punch (I found the 1.5″ circle punch to be too large) to punch out the wheels on all the papers that weren’t the black base….after you do that, you’ll see it’s not too difficult to make that ‘fender cut’ on each end and I used a ruler to cut along to connect…it helps to be looking at her picture when doing all this. If you have Design Space, I pulled in square shapes and sized over the windows so I didn’t have to cut out a yellow car. Thank you will give that a try! Please advise how the icon car was cut out using the different colored papers for different areas of the car ……..there is no way to ‘ungroup’ this car to get the different pieces. 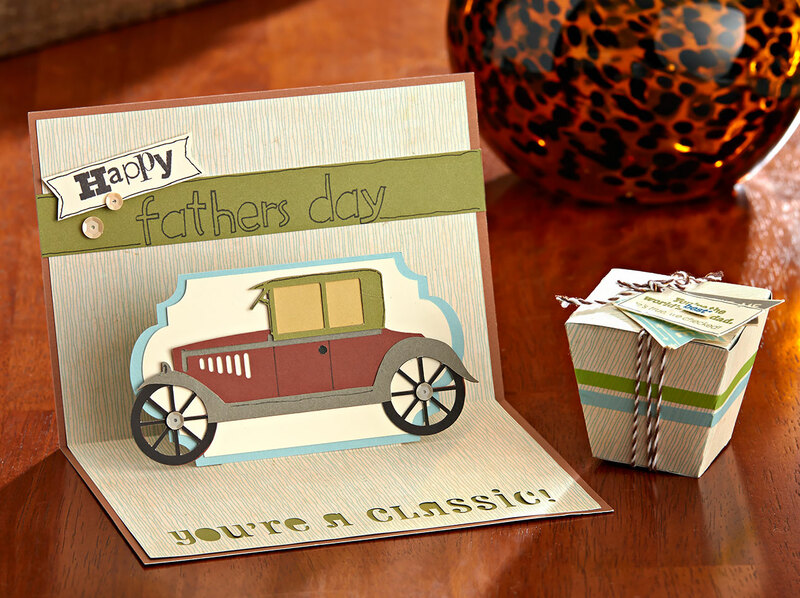 I tackled making this card today and it does require that you cut the car 4 times with the different colored papers and black being your base. But then how did you make the precise cuts to make it look smooth? just by eye? some of the straight cuts seem simple enough, but the fender looks like it takes something precise cutting. Thank you for telling me it was accessible on Deaign Space by entering CTMH. I thought I’d tried that to. When I didn’t find it and a You Tuber she didn’t know when/if it would be made available in Deaign Space I figured it was a lost cause. Glad I asked!